Posh full-back Michael Smith has praised caretaker-boss Grant McCann. Grant McCann would be a popular choice as the next manager of Peterborough United among the playing squad. McCann will be in caretaker-charge of the last two League One matches of the season at Shrewsbury tomorrow (April 30) and at home to Blackpool on May 8 following last Saturday’s (April 23) sacking of Graham Westley. 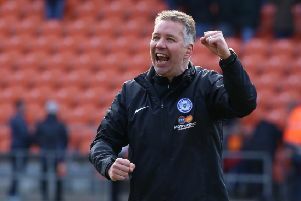 The man who has assisted the last two managers has yet to confirm his interest in the job, but Posh full-back Michael Smith insists the players would have no problem with his promotion. Smith said: “The lads love and respect Grant. They know what he has done for this club in particular and in his career generally. “I can’t speak highly enough of him. If he did get the job no-one would second-guess the decision. “Grant has put on some excellent training sessions this week. We’ve had had short, sharp sessions and the everyone has had a smile back on their face again. “There is no doubt he will put an atacking team out on show at Shrewsbury. The instructions will be to get the ball down on the floor, play entertaining football and score some goals. Smith claimed the squad were surprised when Westley was shown the door last weekend. He accepts much of the responsibility for a third sacking managerial sacking in 14 months rests with the players. Smith added: “We were very surprised the manager left, but we haven’t been good enough in the last few months. We haven’t played to our full potential, especially at home where are results have been bad. “Players lost form at the wrong time and key played picked up injuries and the players do feel some responsibility for what happened. “That’s three managers sacked in the last two seasons and that doesn’t look great on our CVs. Smith is expected to return to the first team at Shrewsbury after missing the last two matches with a tendon injury.